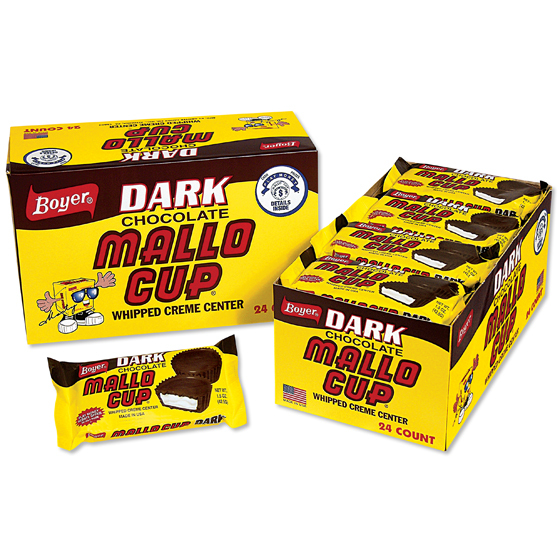 Home > View All Products > Dark Mallo Cups - 24 ct. Dark Chocolate Mallo Cups take everything you love about the classic Mallo Cup but combine it with the delectable flavor of dark chocolate. This American made candy is sure to satisfy your sweet tooth and become your new favorite! Boyer Candy is made in the USA. Experience the flavor of Dark Chocolate Mallo Cups today. Bought a case of these at the factory outlet - they didn't last long! So good - all the varieties are! I bought these on a recommendation from a friend and they are absolutely DELICIOUS. If you hear "cup candy" and only think of Reeses, you absolutely need to give these a shot. FYI, they are shipped in a special container that prevents them from getting hot and melting! How awesome is that?